The ribbon is sewn into black nylon webbing. This adjustable collar is made with side release buckles, and a solid metal ring for attaching tags and leashes. These are sturdy fashion collars, perfect for walking even the strongest pullers, training classes, cosplay outings, and any other time you need a collar to attach a leash to. ~*~ To make sure the collar fits, it’s best to get an accurate measurement of your dog’s neck. To do so, use a soft/flexible measuring tape (found at most craft stores), and measure around the thickest part of your dog’s neck, which is usually near their shoulders. It’s best to add an additional inch or two to the measurement to ensure a comfortable fit, and if your dog is a young puppy, add three to four inches, or select a larger size to ensure they have room to grow into the collar, as puppies often grow out of their collars fairly quick. Quick, time saving tip: Measure your pets current collar, from the base of each buckle, or from the buckle to the hole used, as this will give a good idea of the collar size you need. Please note! These collars are ~*Fashion Collars*~. 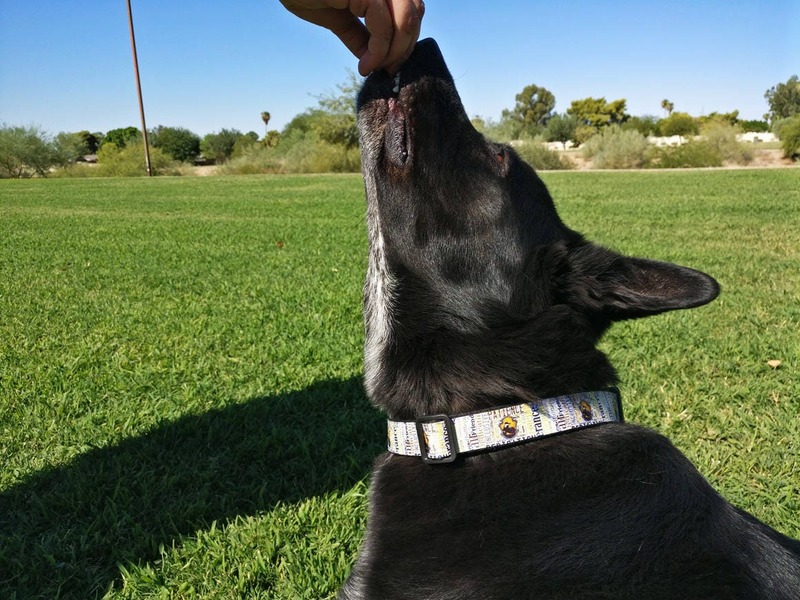 They can be scratched and the design ruined (though the collars themselves are amazingly tough and strong, we use them on my 95-pound GSD who pulls like mad, and my 90-pound Australian Kelpie). We use these for service dogs in the Service Dogs of Arizona group, and trainers buy them because they look amazing and are very strong. I can add a very basic Scratch Resistant coating for $2 extra Upon Request, but be warned, they will not dry as fast after getting wet.. Please note, the basic coating will catch basic scratches for a short while, to really make the collar as scratch resistant as possible, you need the advanced coating. We have had dogs wear these collars for years without ever being removed, and have also had some ruin the design in a few days. The same as with any collar purchased at a pet store, or even chew toys, how long they last depends on the dog. We suggest removing them with the dog is indoors, at night, or unsupervised. Payment can be done in person or online. For online purchases, we accept PayPal, Etsy Gift Cards, Credit Cards, and Debit Cards. In person payments, we allow for Cash, Credit Cards, and Debit Cards using my Square Up Card Reader. This will be during conventions or similar local meet-ups. .
Payment is due within 14 days of purchasing the item, and the item will not be shipped until the payment has been made. After 7 days without payment, the item drops to the bottom of my To Do list, which may mean it will take longer for your product to get to you. After 14 days without payment, the sale is canceled. Tax is included into the price of the item. I'll ship anywhere. I am always very careful to be sure the products I ship are wrapped safe and secure so they arrive to you with no damage, but if you request I can limit the packaging in order to drop the price. I do offer insurance, next day, confirmation, upgrades... anything you wish, simply contact me! I will do my very best to meet deadlines, so let me know if there is one! I also offer custom gift wrapping, as well as allowing you to include a Gift Receipt or note to the recipient. Gift Cards are also available. Refunds are NOT issued if your dog/cat scratches up or chews their collar/leash. The design on them is made using ribbon, usually grosgrain ribbon, which is not scratch proof in any way. I have scratch-resistant coating, but these are very basic barriers and should not be considered scratch proofing, just a helpful barrier. Also, the coatings are designed to help prevent the collars from being scratched, nothing else. The coating is a thin layer of plastic sewn on top of the design, so they will give the collar a glossy look and will make them take much longer to dry. Please pay close attention to the size you are ordering, as well. 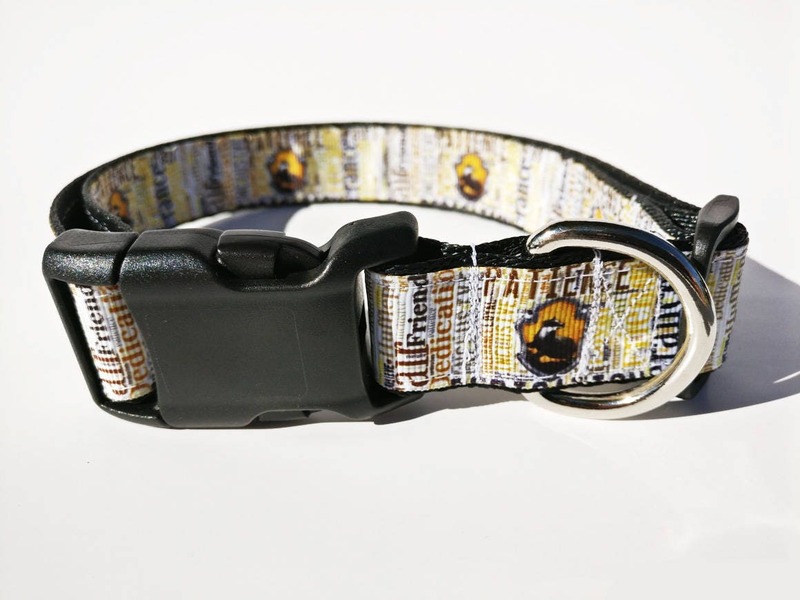 Make sure you measure your dog's neck and/or their current collar to be sure of the width and length that they need, as every order is made as it is ordered, making every order custom, so I cannot refund if you order the incorrect size. Please measure your pet carefully before placing your order. Each consumer is responsible for determining the suitability of these products for their individual situation. Consumer accepts all responsibility by purchasing and using these products. If you are worried about the collar being scratched, please contact me before purchase. Returns and replacements are done in the rare instances that something goes wrong; a return and replacement allows us to correct the issue and send the collar back to you. To ask about a return or a replacement, please send me a message through Etsy or Facebook (facebook yields a quicker response). *Pet Shampoo cannot be returned as we cannot re-sell the item or donate it to a rescue as there is a contamination risk. 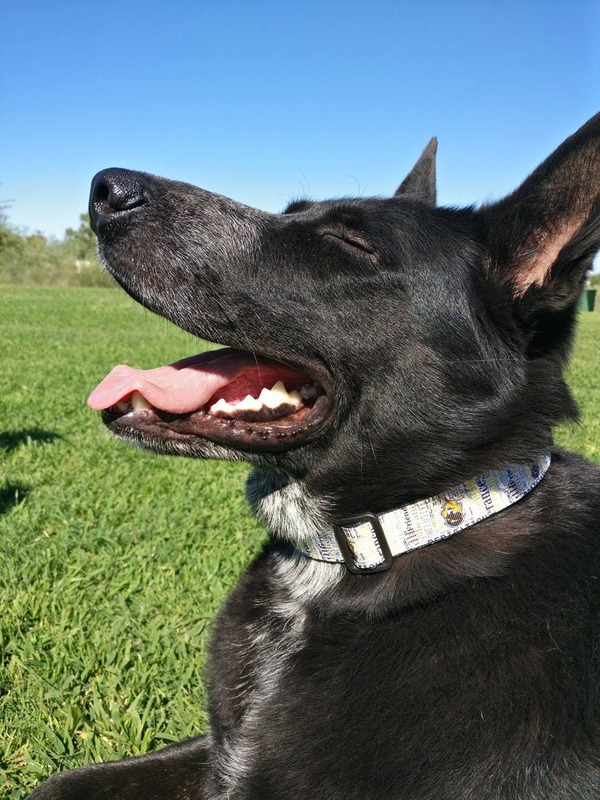 * Collars can be returned for a replacement within 7 days of delivery. Please note, I am not responsible if your animal chews or scratches up their new collar, if a child or someone cuts it up, or any damages that are not caused by my workmanship. Buyer is responsible for shipping, so please ask questions in advance and make sure of your order. Ordered the wrong color/scent/size/etc.? No problem! Contact me through Etsy, and as long as the order hasn't been packaged for shipping, I will make the changes. You can remove items, add items, change details. . . just let me know what you need! Please be aware, you will be responsible for price changes. Also please note that 100% custom orders will have additional fees for changes. Also, please note that if the order has already been shipped (and I try very hard to mail the same day/day after the order has been placed) then there is nothing I can do for you. . . I am a one person shop and this is my only income, so every penny counts and refunding orders because the incorrect size was purchased means that I am totally out that money, and it is my only source of income. I am not responsible for lost / stolen / buyer damaged products. I will feel for you should someone steal your item or it becomes otherwise unusable, but I am a small company making these items with very little profit, so I am limited on what I can do. No fashion collar is 100% scratch resistant to dogs, so if they manage to ruin their collars, or the plastic buckles get crushed, that is not an error on my end. I may be able to offer you a discount to replace the item, but no refund will be given. I purchase very strong, secure materials and would love to answer any questions you have before you order so that we can make sure you have the best product. I like to think of myself as friendly, so please contact me with any questions. Custom and bulk orders are very much welcome! And we offer a discount for organizations that are directly serving service dogs, such as the Guide Dogs for The Blind. My dog collars are made with the finest quality materials. The tough nylon webbing chosen offers strength, longevity, durability, and peace of mind. The metal D-rings offer solid, sturdy reliability, and the buckles are tested and true. These collars can be hand washed to be kept super clean and brilliant looking, and will not bleed in the wash. I started making these collars when I was upset about the limited design choices, and the questionable quality I was finding in many pet stores when it came to collars. My dog, Lakoda, is a German Shepherd / Husky mix, and he’s very prey driven, so he pulls and he pulls with all his strength. The stronger buckles made it very hard to get his collar off when I needed it off, such as for his baths, and the ones that opened easily let me see the heartbreak that can occur when a collar fails, especially on a dog who has not yet learned a reliable recall, and thinks chase is a fun game. 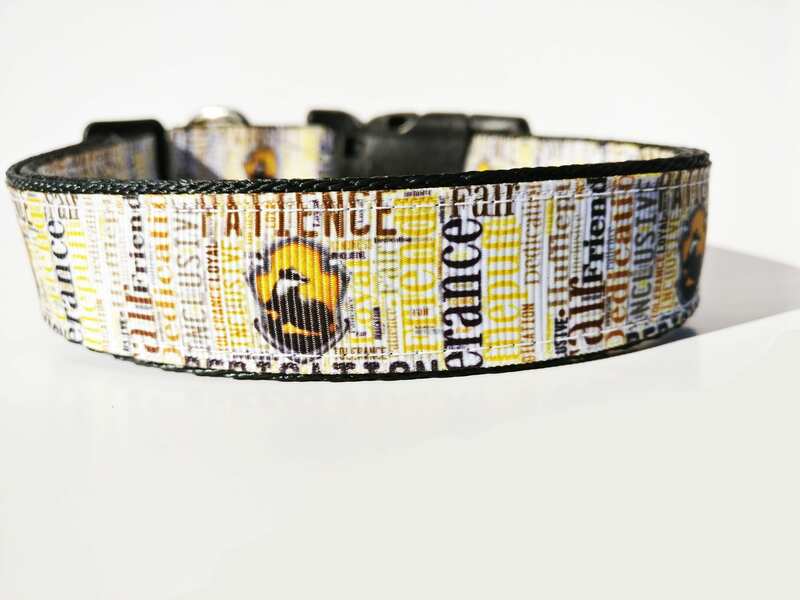 I wanted a collar that was strong, sturdy, and I wanted designs that spoke stronger to me. I realized that I can create my own fabrics, as well as purchase pre-made designs that allowed for almost limitless options for design, and because I control the stitching, and what thread is used, I can control the strength of the collar. I ship out collars as soon as possible after receiving the order. Because some of these will be made to order, a few extra days may be necessary in order for the collar to be made. I ship on weekdays only, but still try to get your order to you as soon as possible. If you need a faster/different shipping method, please contact me before ordering! If your collar is not as you had hoped, please contact me and we will make arrangement to be sure we come up with a satisfactory solution. Came just as ordered and looks so cute on my dog!